Lady and the Blog → Personal Blog → Daily Diary: Puppets. Puppets. Everywhere. Daily Diary: Puppets. Puppets. Everywhere. During our New Year’s Day celebration yesterday (at my house of course), my cousin gave the kids their Christmas gifts. PUPPETS! They were so excited!! These puppets are from the same company that supplies Avenue Q – so I thought that was super cool. They are NO JOKE. Natalie got a princess and Liam got a pirate. Anyway, they started to run around and pretend to speak through the dolls … and then it got a little weird. When everyone left the kids decided that I could only speak to them through the puppets. I kept having these flash-forward dreams where my children become struggling puppeteers both vying for a position on Sesame Street. LOL!! What will become of them? Morning came and I wanted to see if they were (literally) attached to the puppets in the AM. Of course they were! Thank goodness for school. A little alone time will go a long way. 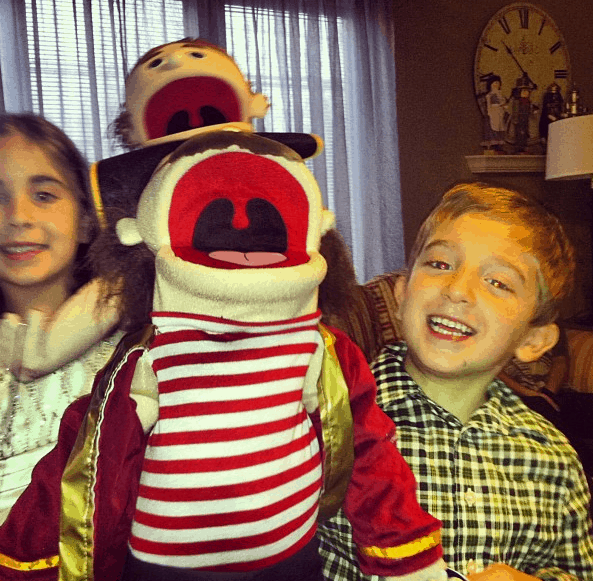 PS – both puppets are on my bed so I can “play” with them while the kids are at school. Previous Post: « FINALLY Started Watching Downton Abby: Any Fans?